Do you think outside the box when it comes to jewelry organization? 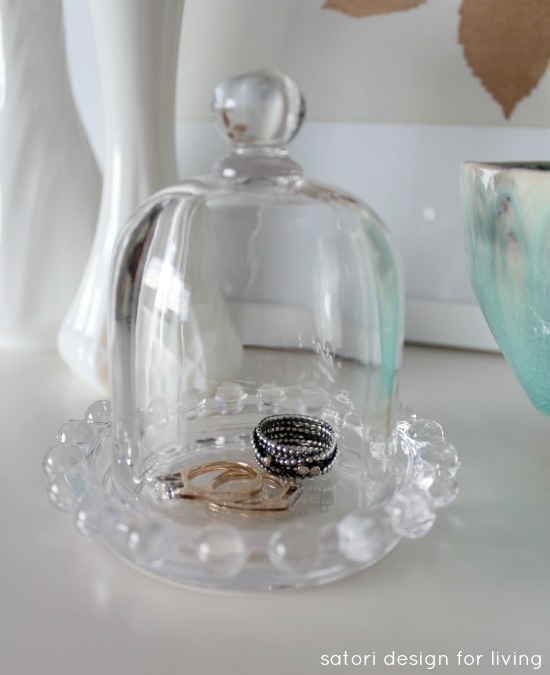 Take a look at my new jewelry cloche! On my birthday trip to Vancouver over the weekend, I was fortunate enough to do a little shopping and picked up an adorable individual butter dish. A while ago, I promised myself to only purchase items I had a specific plan for (even if something was a bargain). I’ve never been one to be wasteful or spend money foolishly, but I did find that we always seemed to have stuff to take to the second hand store or items sitting in cupboards and drawers for far too long. So, with that in mind, I decided that only one glass butter dish would come home with me to be repurposed as a jewelry cloche. I’ve always been drawn to depression glass, both vintage and reproduction, so it didn’t surprise me that the table of glassware is where I spent most of my time pondering at The Cross. The cake plates, goblets, votive holders and other tableware were stunning. Items like these are beautiful on display in the kitchen and dining room, but they can easily be used in other parts of the home if you just think outside the box. 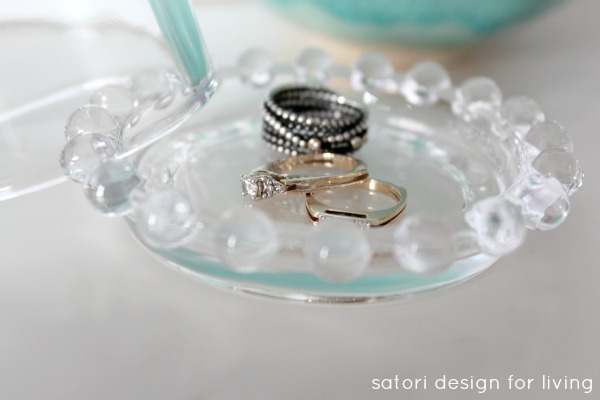 At the moment, I’m using the butter dish in our bedroom to store my rings. I may eventually use it for another purpose (perhaps even butter), but for right now, I’m liking the way it adds a bit of sparkle to our dresser. 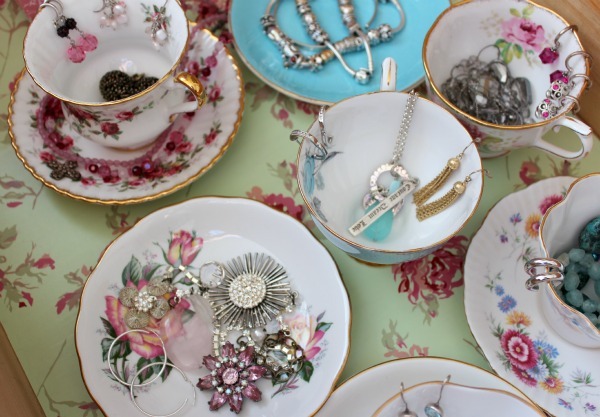 If you like this idea, you may also want to check out my tea cup jewelry organization project. Have you set any rules or guidelines for shopping? What items have you purchased to be used in a different way? Sounds like such a big job. Are you doing it all on your own? This is lovely, Shauna! I love cloches – and this little butter dish is too sweet! I love it! 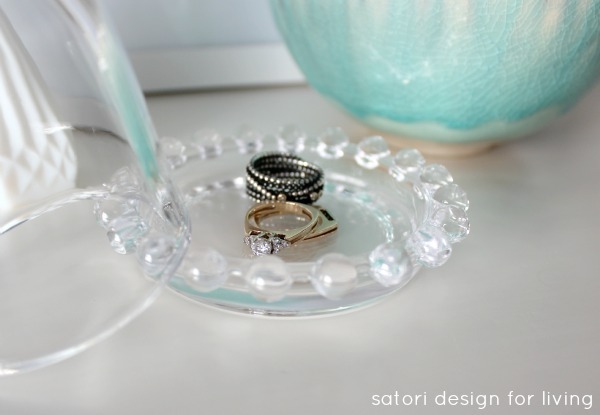 Super clever alternate use, it’s perfect as a little jewelry dish! 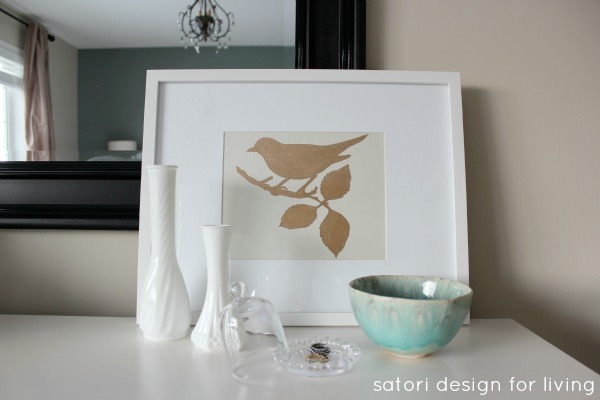 Just stopping by to pin this, and to let you know I featured it on my blog today! This is a very pretty way to “up cycle” a butter dish. I love the little glass knobs, so delicate. Saw your feature at Practically Functional.